Coney Island, located on the east side of Cincinnati, offers refreshing fun and great exercise. 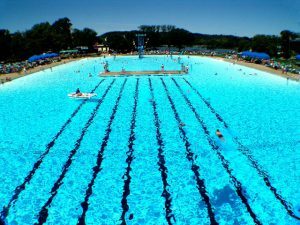 Spend the day walking around, riding rides, or visit the famous Sunlite Pool, the largest flat-surface pool in North America. Sunlite Pool is an excellent place to break out your new bikini. You can catch some rays, swim laps or go down a waterslide or two. Sunlite Pool is a day of fun in itself! Coney Island is set right on the shore of the Ohio River, offering picturesque scenery at the park and the drive. Mason, OH, offers two great parks right next to each other. Book a room at Great Wolf Lodge and experience the thrill of an indoor waterpark. Take the family or plan a romantic getaway. Eat healthy at the restaurant or buffet located within the lodge. You are always welcome to bring your own food in as well. Next door to the lodge is Kings Island. Spend a day, or two, having fun and being active with the family. Kings Island offers world famous roller coasters and entertainment. Don’t forget to grab your bathing suit and visit Boomerang Bay water park. Head north toward Cleveland and check out Cedar Point. Cedar Point is another combination theme park and water park. Book a room in an on-site hotel and enjoy a weekend walking around and riding rides. Pack your cooler with plenty of water and enjoy a picnic outside the main entrance. Soak City is a great place to have fun in the sun and show off your new body. So get on out and have some fun this weekend!